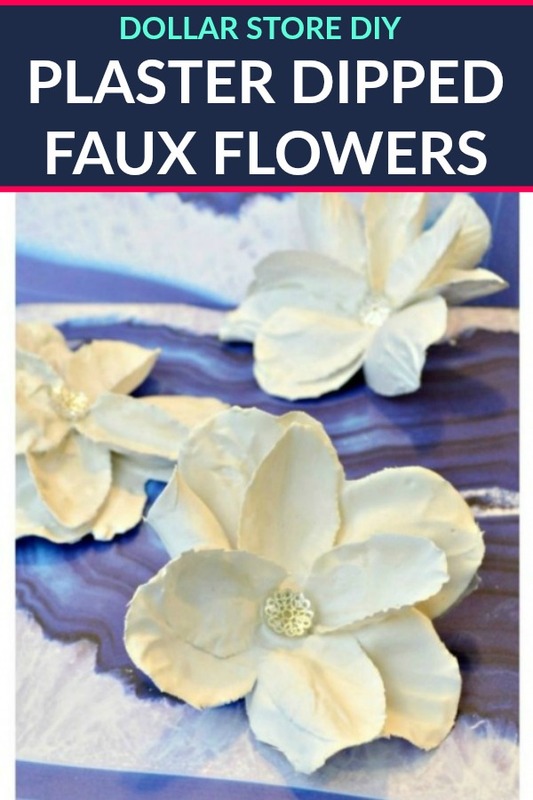 WHITE Dollar Store Flowers – The picture you see shows a whole bunch of pretty, bright flowers, BUT only the white flowers worked!!! FIRST OF ALL DON’T DO AS I DID AND USE A PINK FLOWER! ONLY USE WHITE FLOWERS. Deconstruct your flowers. Cut off the stem and then remove the little piece on the back that is holding together the flower. 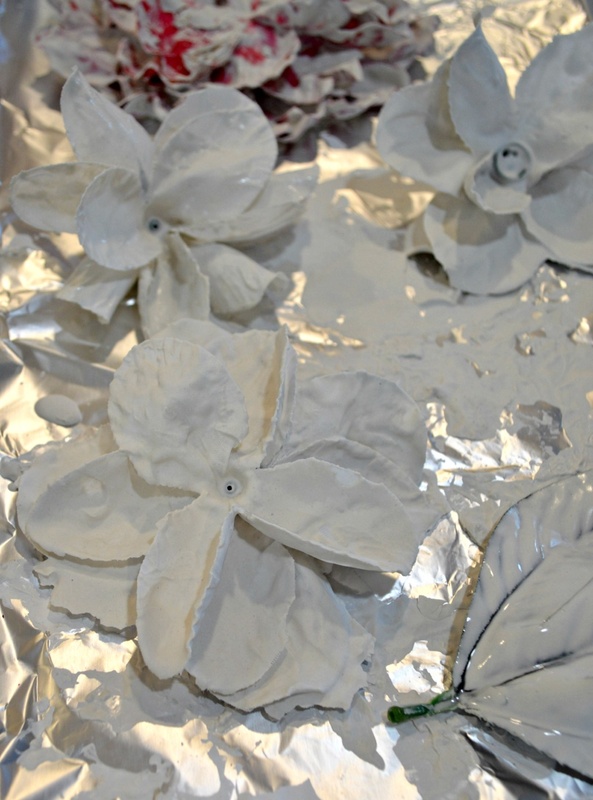 Try VERY hard not to lose any of the little plastic pieces as you will be reconstructing your flower. Take the layers of petals apart and toss the stamen (I think that’s what you call the little yellow parts that you can see in the picture of the materials) but keep the plastic parts that hold the flower together. Not cute and that was after I dipped it twice. Not worth the headache, I promise you. The white flowers only needed one dip. So much easier. Reconstruct your flower. Put the petals back together and thread the little plastic part back through the center and stick it back into that other plastic part that looks like a jellyfish (sort of). This is way easier than I’m making it sound. Don’t get scared of this part. 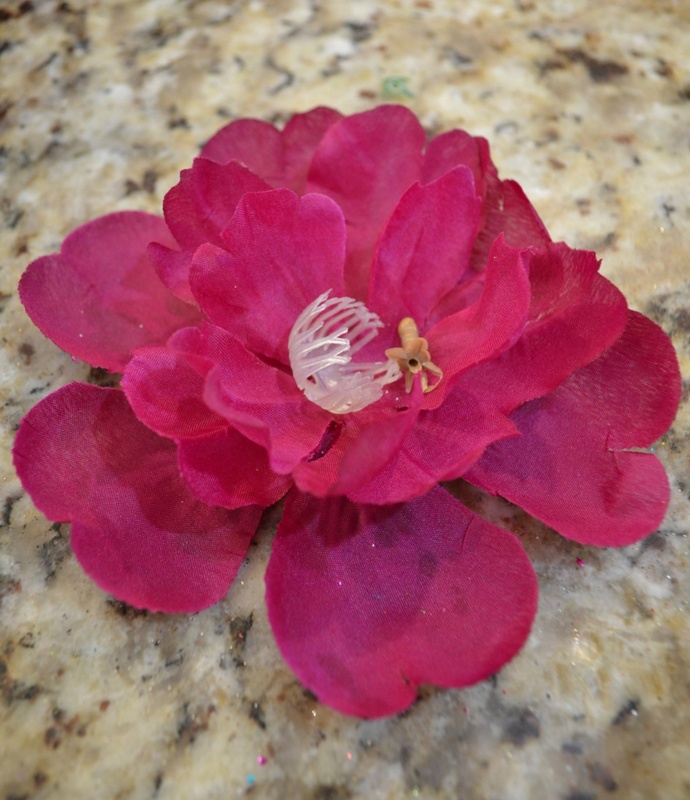 If you really can’t figure out how to put the flower back together, you can just hot glue it back together. Repeat steps 1 and 2 with all of your flowers. 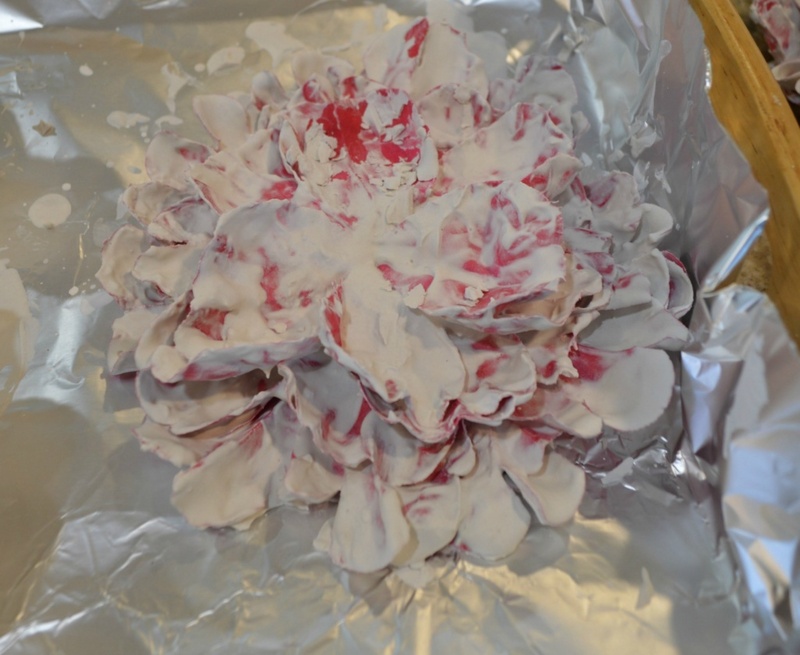 You will not have time to be messing around with pulling flowers apart after you have mixed your Plaster of Paris together. That stuff sets up pretty quick and you will have literally minutes to work with it before it becomes unmanageable. 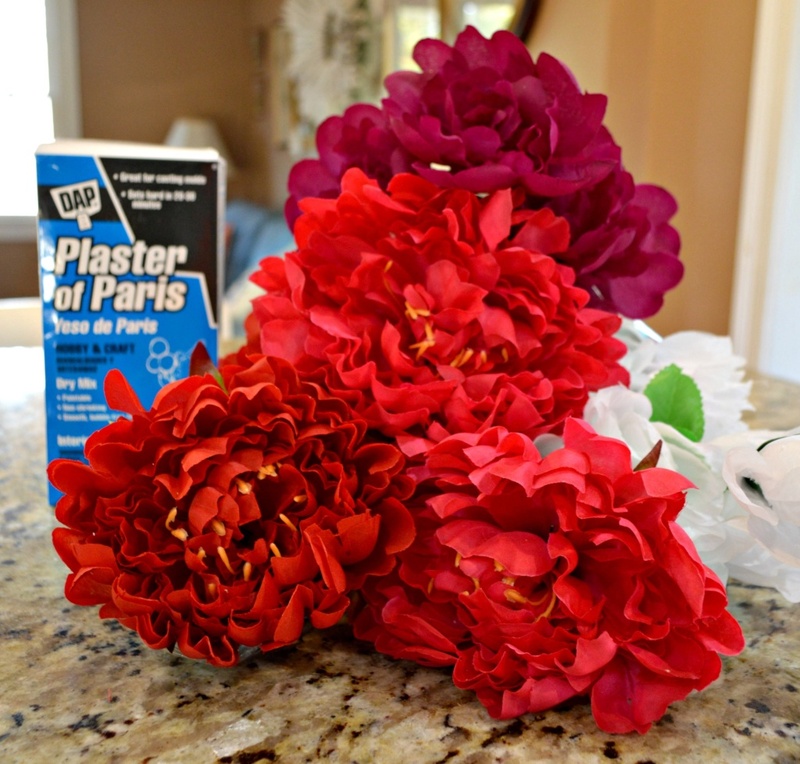 Set up a place that your flowers can dry after you’ve dipped them in the plaster. I used an old tray lined with tin foil. This worked perfectly. Nothing stuck to the tin foil. Wax paper would probably also be great. Mix your Plaster of Paris according to the manufacturers instructions. Don’t get fancy and think that you know more than the manufacturer and add in a little more plaster because you think it’s too thin. You will be wrong. How do I know? Because I did it and it was a big fail. So, do what the label tells you to do, ok? 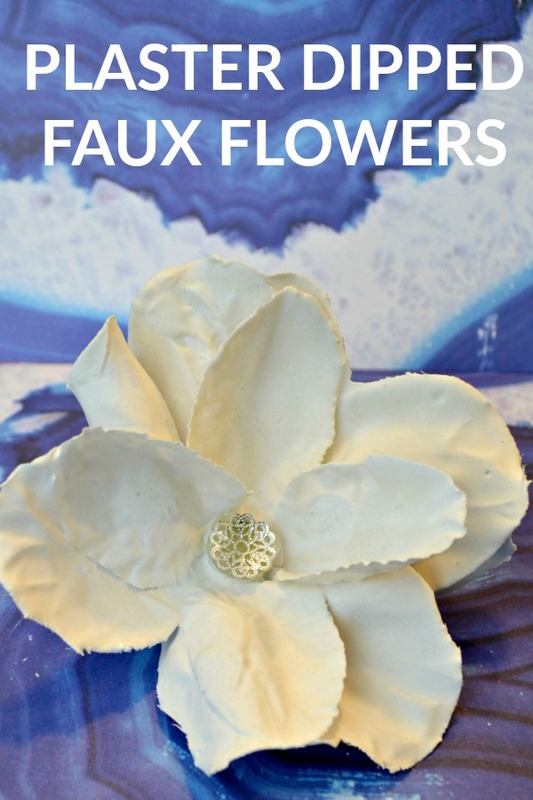 Dip your reconstructed flowers into the plaster mixture one at a time. The method here is dip, twist, dip, make sure all crevices and the back of the flower are coated, then lift out of the plaster mixture and give it a little shake and a tiny shimmy to remove any excess. Gently place the flower on your already prepared drying surface. At this time you can sort of position your flower in a position that you find appealing. 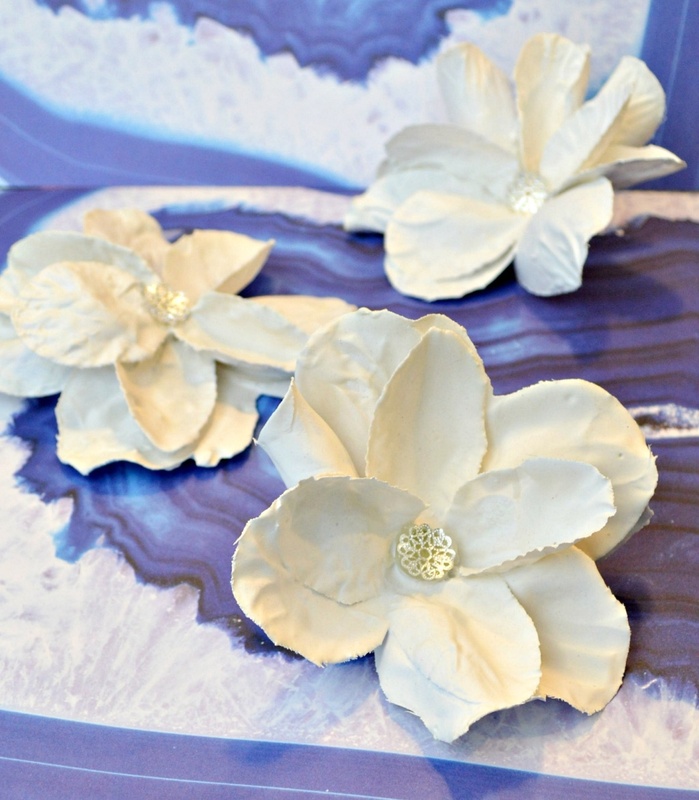 Although I used three of the same white fake flowers, after dipping each, they all had a different pose, if you will, when I placed them on the drying surface. One was super upright and perky, one was sort of flat and the third was in between. I loved that about them. Allow to dry. It doesn’t take long. About 30 minutes and you can handle them. Here’s about what you will get for a finished product. I think they are absolutely lovely, but I will caution you that they appear to be very fragile. I think they would be amazing on a picture from, or on the corner of a mirror, but I would want to work with them more before putting them on anything that would be handled often. I actually think they would be really beautiful Christmas ornaments if you were going for maybe a white and silver theme. 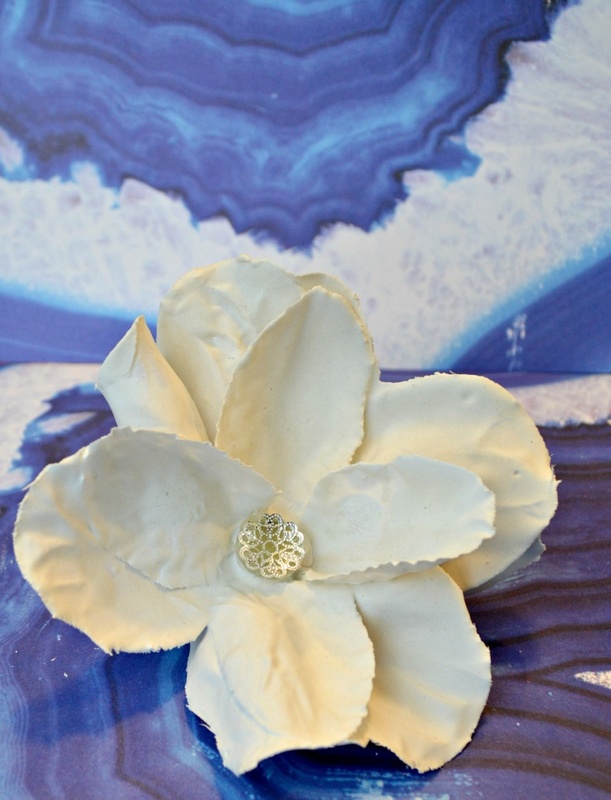 If you can find some fake white poinsetta’s, it would be gorgeous. I’ve also thought about finding tiny flowers and dipping them and making them into jewelry, but I’ll have to see how well they hold up. So? What do you think?? Give these a try if you’re in the creative mindset. They were fun to make and super easy and I think they are so impactful.